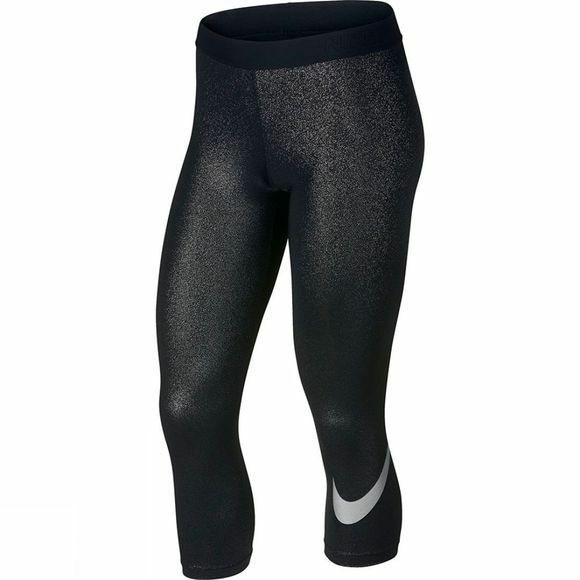 The Nike Pro Women's Training Tights feature sweat-wicking, durable fabric and an updated waistband to keep you dry and comfortable at the gym or studio. An all-over sparkle lets you shine at the gym or studio. Designed for: To/From Studio, Workout Warmups, Mobility Workouts (Foam Rolling). Dri-FIT fabric wicks sweat away from your skin's surface to help keep you dry and comfortable throughout your workout. Durable mesh fabric under your arms help keep you cool. A snug elastic waistband holds the tights in place while durable, four-way stretch fabric lets you move easily. They believe that if you have a body, you are an athlete. Nike's mission is what drives them to do everything possible to expand human potential. They do that by creating groundbreaking sport innovations, by making their products more sustainably, by building a creative and diverse global team and by making a positive impact in communities where we live and work.